“The Authority…recommends that a uniform licence fee of 8 per cent of the AGR (adjusted gross revenue) shall be applicable for all ISP and ISP-Internet Telephony licenses,” Telecom Regulatory Authority of India mentioned in their Release. TRAI has actually suggested a new revenue stream for Internet Service Providers (ISP), on which the government ‘should’ levy a 8% licensing fee to be charges annually. Currently, TRAI levies license fee on the annual gross revenue of telecom companies, which are charged after deducting some revenues which are not charged from core telecom services. 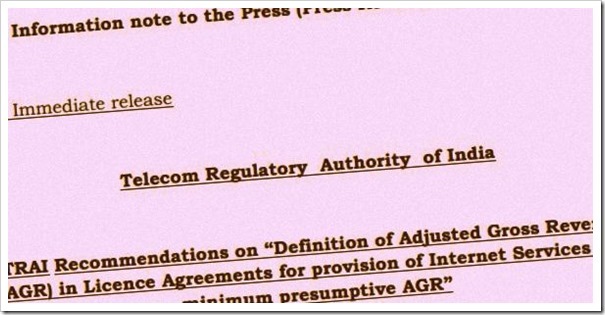 Earlier as well, TRAI had recommended this 8% license fee and had suggested to be levied from April, 2013 onwards. But that was put on hold in the past as some discussions and questions remained unanswered. This issue has again cropped up now. Internet Service Providers Association of India has opposed this decision and has clearly informed that this will impact their efforts of higher penetration of Internet in rural areas. They have planned out a blueprint to achieve 175 million broadband connections by 2017 and 600 million by 2020. But these plans cannot be achieved if TRAI decided to hike Internet charges. According to him, TRAI had earlier allowed discount of charges from Internet services but still there remains some issues regarding the service charges. As of now, TRAI charges 6% licensing fee and had first proposed increasing this fees to 8% in 2007.